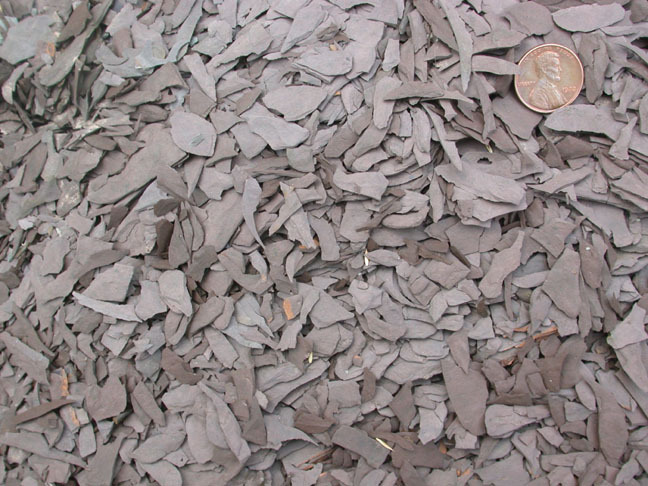 Mudstones and shales are made of silt- and clay-sized particles that are too small to see. 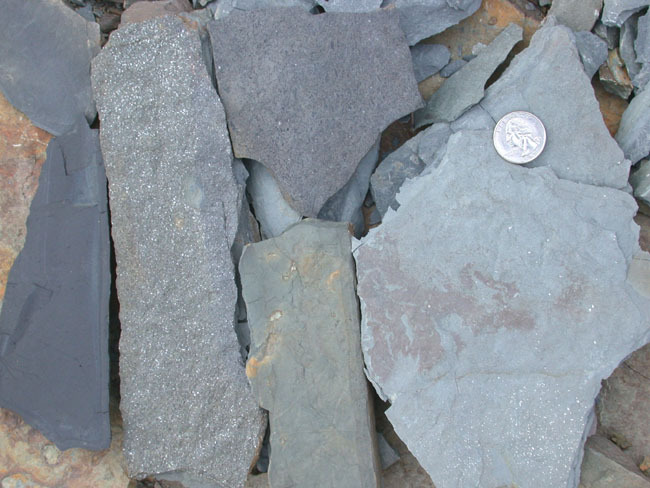 The only difference between mudstone and shale is that mudstones break into blocky pieces whereas shales break into thin chips with roughly parallel tops and bottoms. Both are made of ancient mud. From the point of view of understanding the ancient conditions of sediment deposition, it is more useful to subdivide mud rocks into siltstone and claystone. 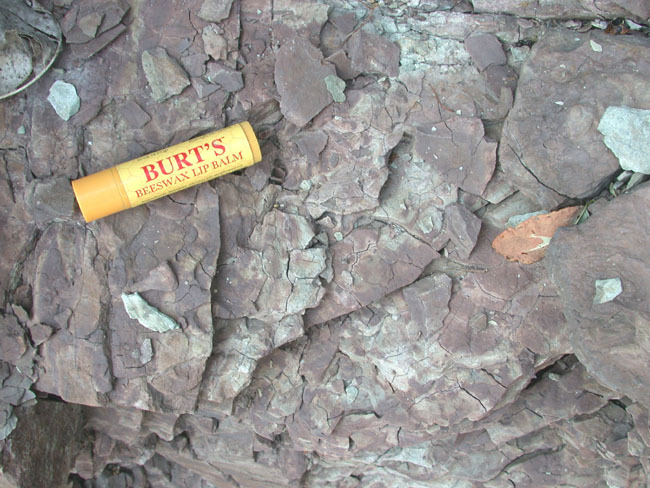 We cannot see the difference between these rocks, but it turns out that siltstone feels gritty when nibbled or rubbed against a tooth whereas claystones feel smooth. If you find a claystone, you know that it accumulated in a very quiet environment with almost still water. 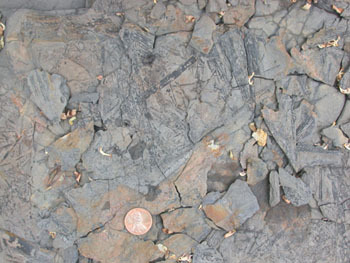 Even a close-up view reveals no visible grains in these chips of shale. A little nibble on a corner indicates that this is a claystone. 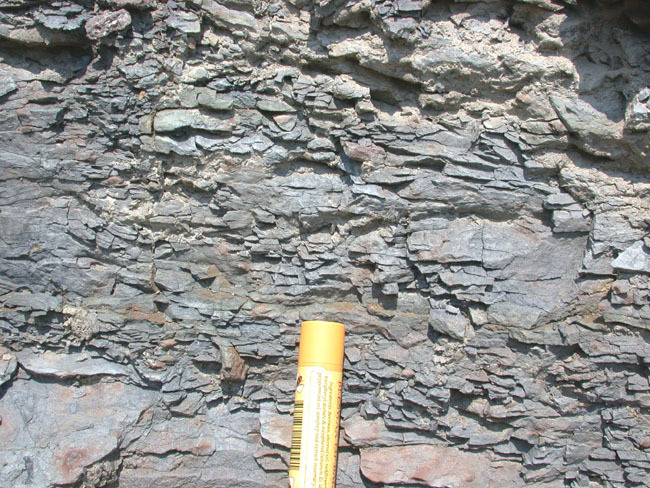 A fresh (unweathered) shale may be a fairly solid rock. However, when exposed at the surface many shales rapidly distintegrate. Many shales are rich in fossils. 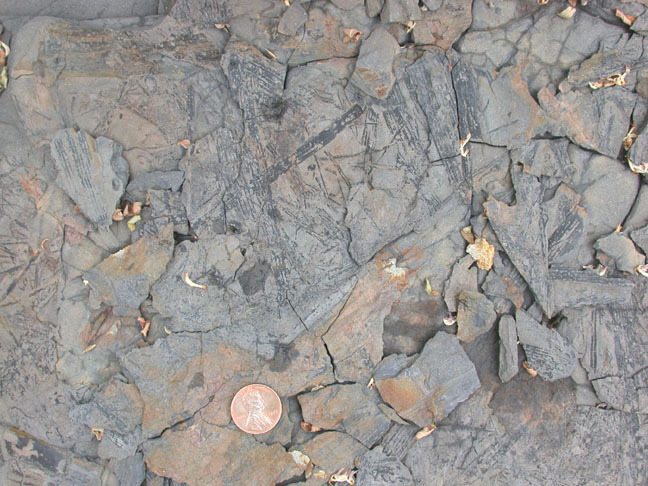 The black things in this shale are carbonized fossil plant materials, mainly plant sterms that are 300 million years old. Shales commonly come in many different shades of gray, black, green, and red. Gray and black shades primiarly reflect organic matter content (black = lots of organics, grey = low organic content). I'll cover red and green below. The close--up view shows silvery flecks of muscovite. Although these are sand-sized, the bulk of the rock is silt- and clay-sized and thus is a shale. This is a red shale with greenish mottling. 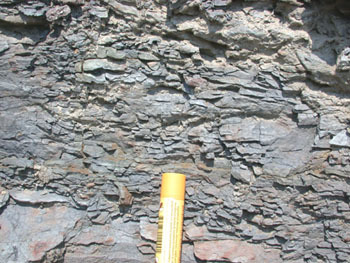 Both colors indicate iron oxide coatings on the clastic grains. The red color indicates fully oxidized iron whereas the green color indicates iron coatings with partially reduced iron. This is your first example of a mudstone: instead of breaking into thin chips and plates, it breaks into irregular blocks. The nibble test indicates that this is a silty mudstone.